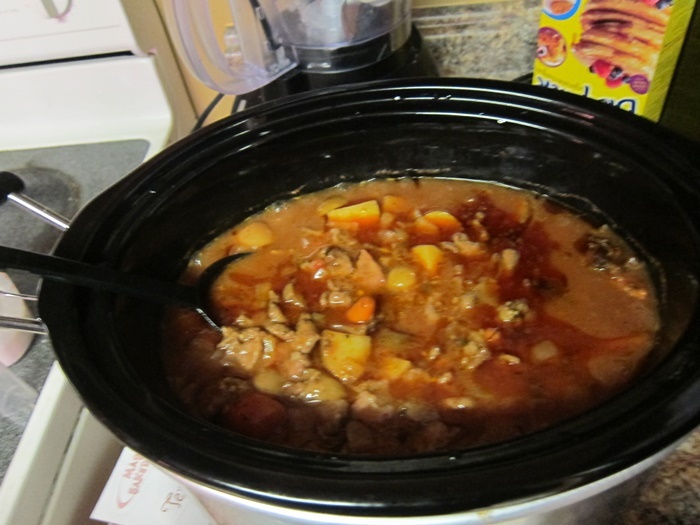 It’s finally getting cold enough for stew! This recipe makes a decently large amount, and I’m quite contentedly plowing through it all by myself. While I was getting ready to make this, I asked several friends if browning the beef really does improve the overall flavor (I was feeling lazy and hoping to skip it) and the answers ranged from “yes” to “YES YOU HAVE TO DO IT”, so I did it, and you probably should too! 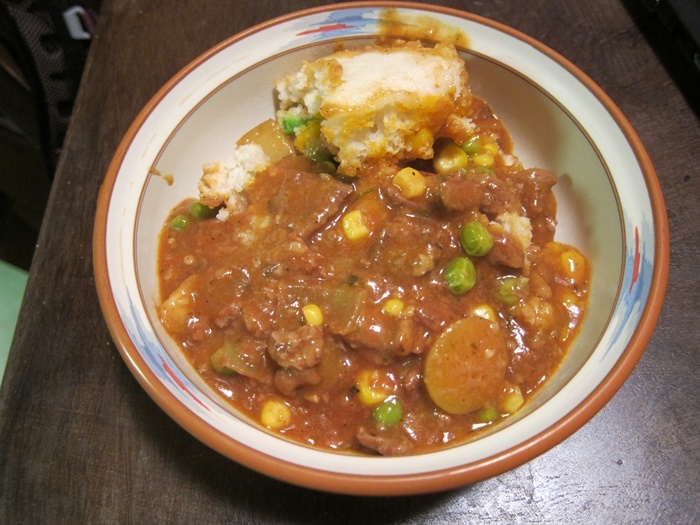 Stew: Not a glamour food. Season the beef with the salt, pepper, and thyme. Dredge in the flour, shaking off excess. You want lightly coated, the goal isn’t deep fried battered beef! 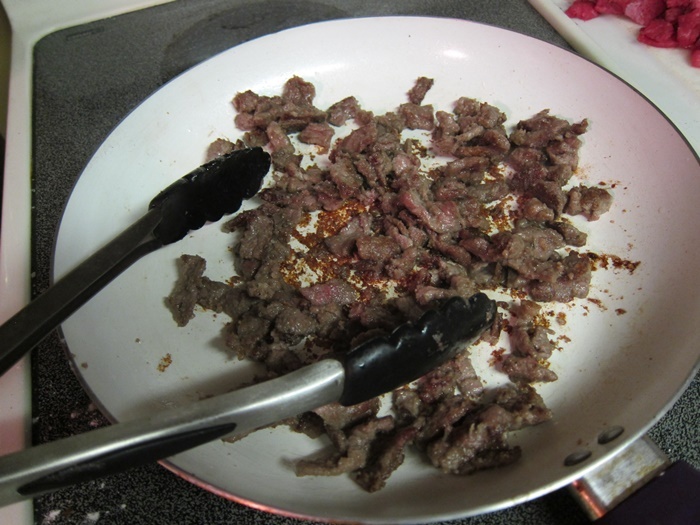 Heat the oil in a large pan over medium high heat, and cook the beef until browned on all sides. 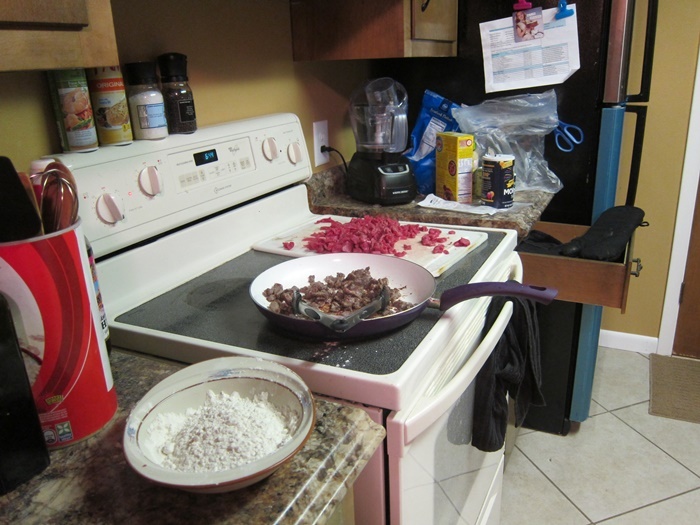 You may need to work in batches to give the beef enough room to touch the pan. Add extra oil as needed for additional batches. 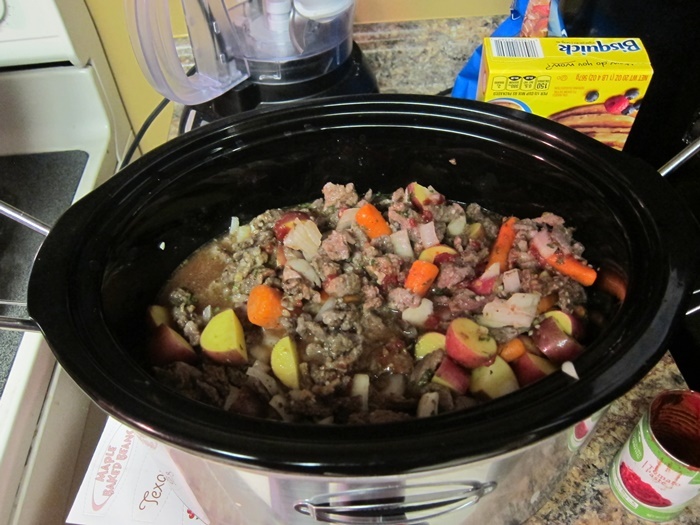 Transfer the cooked beef to the crock pot. Add the salt, pepper, onion, garlic, tomato paste, broth, Worcestershire sauce, carrots, potatoes, parsley, and oregano to the crock pot. If you want, you can do this the night before, but in that case I’d recommend putting it all together in a bowl instead of the crock, so that the first hour of cook time isn’t just spent warming the crock back up from refrigerator temperature. Additionally, consider cutting the potatoes in the morning, or ensure they are submerged, as you don’t want them to go gray before they get in the crock! 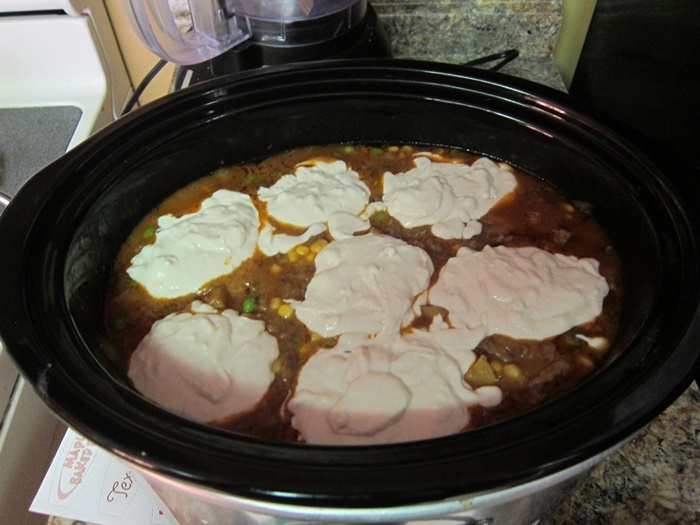 After 9 hours, add the frozen peas and corn. Combine the flour and water, stirring until no lumps remain, then add to the mixture to thicken. Turn the heat to high. Stir together the Bisquick and milk until no lumps remain. Place in large dollops over the surface of the mixture, then put the lid back on. Cook 45-50 minutes, until the Bisquick mixture is completely cooked. 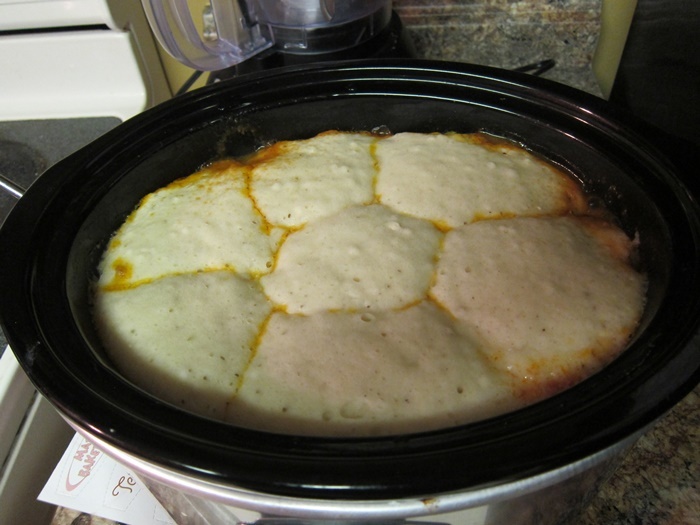 I love Bisquick dumplings so much. They’re not even very interesting, but they make stew soooo good! This is a toast/tasty meal! Season the beef with the salt, pepper, and thyme. Dredge in the flour, shaking off excess. Heat the oil in a large pan over medium high heat, and cook the beef until browned on all sides. You may need to work in batches to avoid crowding. Add extra oil as needed for additional batches. Transfer the cooked beef to the crock pot. Add the salt, pepper, onion, garlic, tomato paste, broth, Worcestershire sauce, carrots, potatoes, parsley, and oregano to the crock pot. Cook on low for 9 hours. Stir together the Bisquick and milk until no lumps remain. Place in large dollops over the surface of the mixture, then put the lid back on. Cook 45-50 minutes, until the Bisquick mixture is completely cooked. 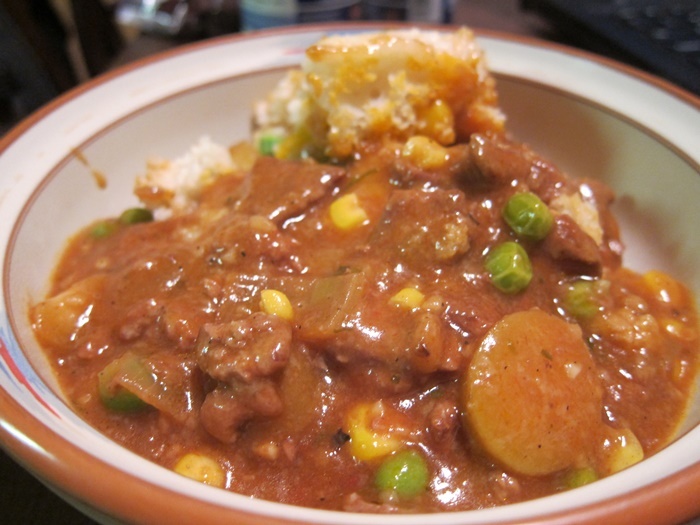 This entry was posted in Dinner and tagged beef stew, bisquick, stew. Bookmark the permalink. It does bring out a lot of flavor. Since it made a lot, I’m glad it’s good!